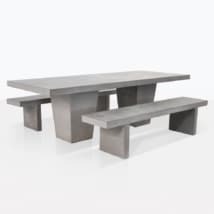 Fresh and stylish with a modern edge and classic lines; the 78″ Raw Concrete Table & 8 Box Chairs Set is an ideal addition to your home or outdoor area. 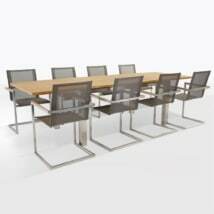 A wonderful collaboration of two fabulous materials makes for a convenient, easy yet luxurious set up which, while being completely suitable for outdoors, also makes an impact inside! 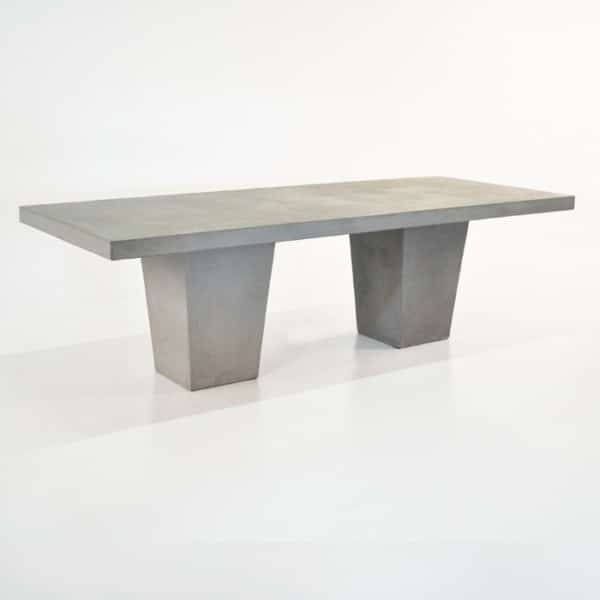 The new modern range in outdoor furniture is raw concrete which gives you a minimalistic contemporary architectural look. Try out the sharp lines of the Raw Concrete Table & 8 Box Chairs Set in loft style apartments, perfect for those cozy winter meals, where guests nibble on tasty treats from your kitchen and red wine flows, all while enjoying a fabulous modern setting. 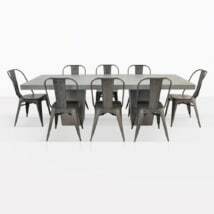 Imagine this dramatic set in amongst the flowers in your garden! 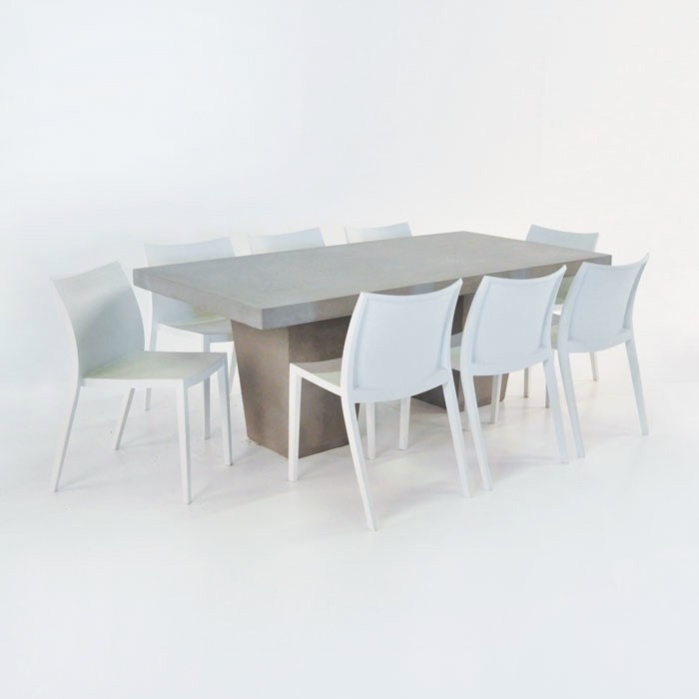 The Raw Concrete Table & 8 Box Chairs Set includes a 78″ Raw Concrete Dining Table with 8 White Box chairs. The Table is a popular one here at Teak Warehouse, defined by a sublime, simplistic design of a thick, robust tabletop and tapered legs constructed from a composite of concrete, fiberglass and resin; ensuring a strong table, but a little lighter than 100% concrete! 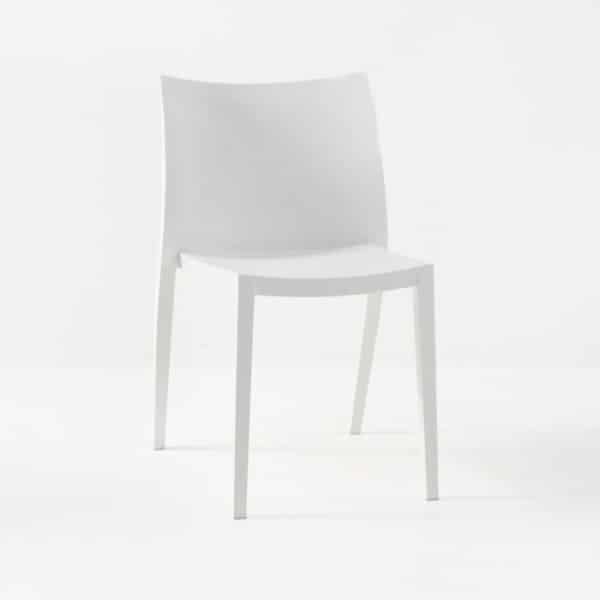 Our Box Chairs are becoming a favorite for commercial properties, as they look amazing en masse, are easy to clean and go with ANYTHING. The Box Chairs are made out of UV treated Polypropylene resin, so you can be assured that your setting will hold up to the elements! Each item is sold separately so you may mix and match as you please! The Raw Concrete Dining Table comes in three sizes, so you think the 78” falls a little short, try our 98” or 117”!